Water damage cleanup can be a beast of a job. It requires diligent focus and attention to detail. It can also be dangerous if not done the right way. We at Clean Masters in the Charleston area want to help you minimize the dangerous risks associated with the water damage cleanup process and help you restore your home back to normal as quickly as possible. Below are a three of the most common mistakes homeowners make in the water damage cleanup process. A common assumption many people make is that floodwater is clean and harmless. That is very false. In fact, floodwater often contains very harmful bacteria and microorganisms that can seriously affect your health. Floodwater often contains bacteria that can cause serious diseases such as cholera, typhoid fever, and even E Coli if the water contains sewage. If your home is flooded, you shouldn’t just jump in and start cleaning up the water without first determining if it is safe to be in or not. Our lives get overwhelmingly busy. When minimal flood damage occurs, it can be tempting to put off the restoration process for as long as possible. However, this is the last thing you want to do. 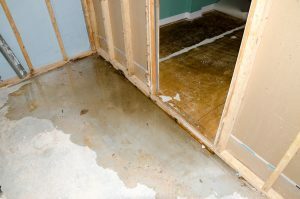 Even if the damage seems to be quite minor, the water will seep into your walls and floor over time and can lead to serious structural damage. Even water left standing for a short amount of time can quickly lead to mold growth and further increase the amount of damage to your home. When water is allowed to stand for even a little bit of time, a small problem becomes a major problem and a much more expensive one to repair! Don’t waste time before calling a certified and insured professional that can help you contain the problem immediately. Many people that follow the “do it yourself” approach to water damage cleanup take on a lot more risk than those who don’t. Completely restoring your home from the water damage can be a lengthy process, and it’s important that you follow the proper procedures. For example, you should immediately begin to air out your home after a flood to get the moisture out of your home as quickly as possible. Your property will definitely experience more damage if this is not done. The DIY approach may seem appealing, but when you don’t know all of the signs to look for, you could make the problem worse. Don’t waste time and money by trying to do the job yourself, call in an experienced professional that can help you get your home back to normal as fast as possible! Don’t undertake a lengthy, dangerous, and expensive water damage cleanup process on your own. We at Clean Masters in the Charleston area are trained and certified in doing all the hard work so you don’t have to take it on yourself. Your water damage disaster relief is just one call away!